Create-A-Book® personalized items give you the opportunity to create unique gifts for any occasion. My Creative Books produces personalized children’s books that are not only educational and inspirational, they’re unique. A book personalized with your child’s information not only encourages reading, but also builds self-confidence, self-esteem and develops a positive attitude toward learning. Everyone loves to see and hear their name. My Creative Books has a wonderful selection of personalized books and a variety of prints that are sure to please anyone on your gift list. Personalized gifts are great ideas for both children and adults. Our books are designed by Create-A-Book® , a reputable company that has been publishing for over 30 years. We appreciate you stopping by to browse through our catalog listing of personalized items. It would be an honor to be your memorable keepsake provider. Our children’s books are custom made . . one at a time . . just for you. Create a book that will be treasured for a life time. All books have full color illustration pages and hard bound, wipe clean covers. 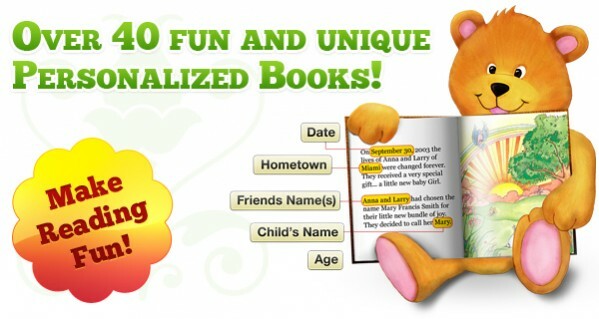 The storyline includes your child’s name, friends’ names, age, hometown, and more. Each book makes your child the “ Star “ of the story. Nothing brings more joy than to see the excitement of children when they open the personalized book and realize the book is about them. Voices echo, "I see my name." No matter the occasion, we have personalized books for newborns, birthday, adventure, sports, Christian, safety, educational, holiday and more. There’s also some gag gift keepsake books for adults. NOTICE: Regarding NICKNAMES . . . The use of a nickname is optional. However, please be aware the nickname is used throughout the story. Dedication Page will reflect the First, Middle, and Last name as written. To make each book even more personalized . . . . a photo frame is included for placing your child’s photo in the front of the book (Style of frame may vary). Visit our “Interactive Library” to read the first 20 pages of the book you selected. This will provide a better understanding of how the books are designed for our young readers. Our books have been shown on Oprah and Good Morning America shows, and featured in numerous magazine and newspaper articles nationwide. Baby books make the birth of your child a treasured keepsake. Details such as, the child’s name, date and time of birth, weight, length, doctor or midwife’s name, hospital name and visitors make this a keepsake gift that will be cherished forever! From newborn to potty training, we got you covered. This is a time when help of any kind is welcomed. Our No More Diapers personalized book is an excellent training tool to encourage your little one to use the potty. There is also a No More Diapers DVD that your child can watch and reinforce the use of the potty. Our personalized keepsake prints are laser printed on lithograph paper, and make a wonderful gift for all ages and any occasion. Browse through the selection of artwork backgrounds that’s available for the First Name Meaning and Origin. Learn the name of your Guardian Angel. Our Birthday Chronicle list the current events on the day you were born. For dog, cat and horse lovers, we have Proud Pedigree certificates that can be matted and / or framed. To celebrate Pastor’s Day present a beautiful gift with Scripture on Art . No matter the occasion or to treat yourself, shop at Variety Gifts and Services facebook page for the perfect gift. Candle Warmers and fragrances for the home or office. Create a spa environment with Diffusers and Essential Oils. Keep warm with Leg Warmers, Boot Cuffs, Hats, etc. Check out the Sales! Thanks again for visiting My Storybook Adventure! Order now and let the magic begin. Today’s Readers . . . . Tomorrow’s Leaders ! Create-A-Book® is the trademark of Create-A-Book® , Inc.